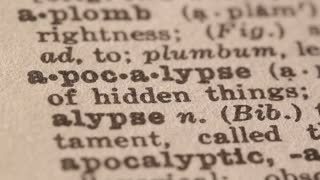 apocalypse - a cosmic cataclysm in which God destroys the ruling powers of evil. Macro close up of Pencil underlining the word Apocalypse in fake Dictionary definition of the word, paper texture visible. A refugee in Haiti covers his face following the devastating earthquake. People walk through the destroyed streets of Haiti following a massive earthquake. Rescue workers search among piles of rubble after the Haiti earthquake. Women carry water through the rubble following the earthquake in Haiti. Piles of rubble line the streets following the devastating Haiti earthquake. Collapsed buildings following the Haiti earthquake. Aerial-Pulling back low over burial pit for dead deer that have been killed on the highway. Animated blood dripping from all caps red text carnage. Blood droplets gets darker as they travel down, top and sides isolated. Transparent background, alpha channel embedded with PNG file. Pride of lions feeding on a young African buffalo kill at dusk iluminated by spot light, Greater Kruger. Animated a lot of blood dripping from all caps text carnage. Blood droplets gets darker as they travel down, top and sides isolated. Transparent background, alpha channel embedded with PNG file. Remains in fire. Genre of horror. Scary background animation. Blue background color. Bones in fire. Genre of horror. Scary background animation . Orange background color. Various shots of dead Japanese and American soldiers in Kwajalein after battling the Japanese in the 1940s. American soldiers battle the Japanese in Kwajalein and shots of dead Japanese soldiers in the 1940s. 1910s: Explosions on hillside. Dead soldiers in a pile. Dead soldiers in the trenches. Firemen extinguishing fire and emergency vehicles on the road. Panning from fire fighters spraying a burning house with water to the road with ambulance and home owners looking at the carnage.